FAQ: What is the best image size and resolution for printing photos? You take a photo that looks amazing and high quality on the screen, but when actually printed on a paper it just doesn’t translate well. In fact, that photo has a lot of digital noise and overall the result is a lot worse than what you saw on the screen. Part of the reason has to do with how a printed image is created vs. how a digital image is displayed. 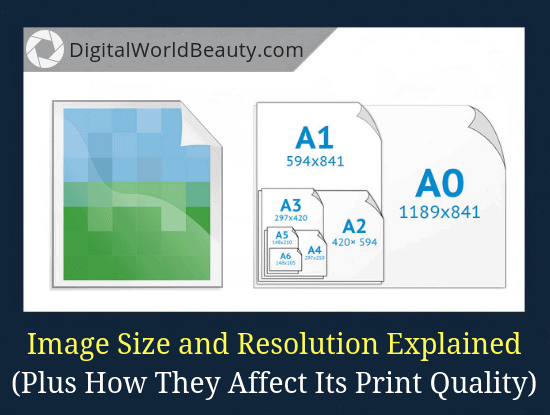 You need to understand how the print quality has to do with image size and resolution. And that’s exactly what I’m going to be talking about today. I’ll try to help you understand these. The number of pixels is measured by “dots per inch”, or DPI. The more pixels in one inch of the image, the higher is the DPI value. An image with a high DPI value means it has a high resolution. And as you know, high-resolution images have less noise, they are sharper and contain a lot of detail. The higher the dpi, the greater the resolution, the better the image quality. The number of pixels determines the photo resolution and is directly related to the number of megapixels (MP) a camera has. A 12 MP camera has a frame resolution of 4288 x 2848 pixels. This means that the width of the photo contains 4288 pixels, and its height is 2848 pixels. Photo experts recommend setting a resolution of 300 DPI to get high quality prints. The minimum is 150 DPI. The higher is your DPI value, the better is the quality of your photo. Another thing worth noting is that the resolution of a said image is directly proportional to its size. If you want to increase your photo’s resolution, reduce its physical size. And if you want to enlarge a photo, lower the resolution. I understand that this whole topic gets very confusing for newbies, so below I’m attaching a brilliant short video that will help you understand the technicalities of an image’s dimensions. … the difference between them and how they affect each other. Believe me, this 2-min video it’s very well worth your time! A4 or 10 x 15 is the most popular print size. Often used for family photo albums. A5 or 15 x 20 print size is the second popular one. A4 or 21 x 29 is a standard office paper size. Often used for decorating walls with photos. 13 x 18 is a rare and rather difficult size used for printing. 30 x 40 or 40 x 50 are nice for interior design. Since this a quite large size, the quality of photos/resolution should be high too. It’s important to choose the right paper. If you won’t, the end result will be an incomplete, cropped image, or with white fields. 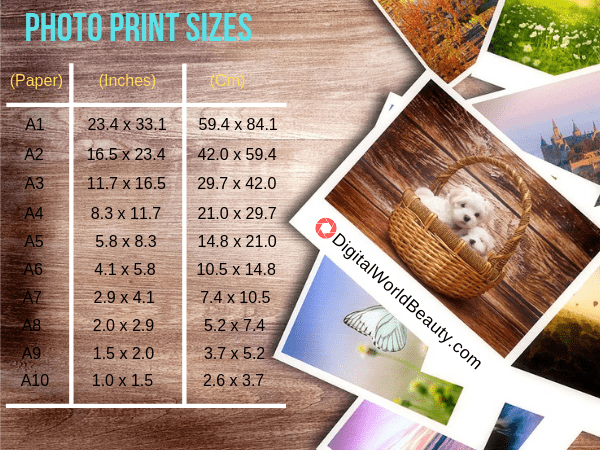 Typically, the photo printing studio presents a guide with image sizes/formats for printing with examples. If you decide to order photo prints online, then the system will provide the best parameters for you to have a high quality image. If you choose the format of your choice, instead of the one recommended by the system, then as a rule that online service isn’t responsible for low-quality results. What’s the point of prints when we live in the digital age? Moreover, because we live in the digital age actual print photos are some sort of a unique phenomenon. A lot of people (and especially companies) will argue that you’ll need more and more MP if you want your images to look great. An average photographer with a 10+ megapixel camera will be able to get a 16 x 20 inch print of amazing photo quality, full of detail. So, while it’s nice to have the latest and greatest, your current camera might be just fine! What is your current photography gear? Have you understood how image quality and resolution impacts print quality? If you have any thoughts, let us know in the comments below!